Happy New Year, dear readers, and welcome to 2019! I know I'm just a hair early with the New Year wishes but I'm anxious to welcome 2019 in and begin living more with simplicity, which is my one perfect word for the new year! I'm excited to see where I find this word living in my life in the coming year. 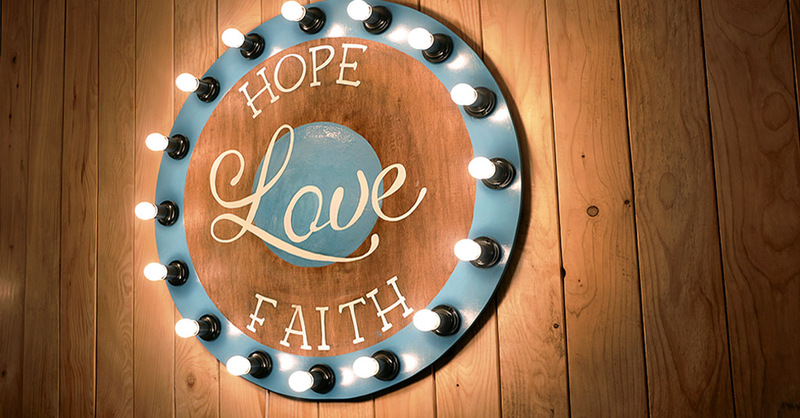 It is a word that I actually began to notice and pay attention to back in September when I went on my annual weekend retreat with my group of amazing ladies that I meet with monthly to pray together, share life and support one another. One of our leaders gave us a sheet of words about growing in faith to ponder and see which ones spoke to us in some way. Simplicity seemed to really grab my attention and I began researching about how simplicity applies in the Christian faith and with life in general. Life can get hectic and complicated at times, or at least it seems that way to me, and, frankly, I'm ready for a little more simplicity. How about you? But first, a little recap of how this last year has gone on the blog and personally. 2018 has brought some challenges on both a blogging and a personal level. 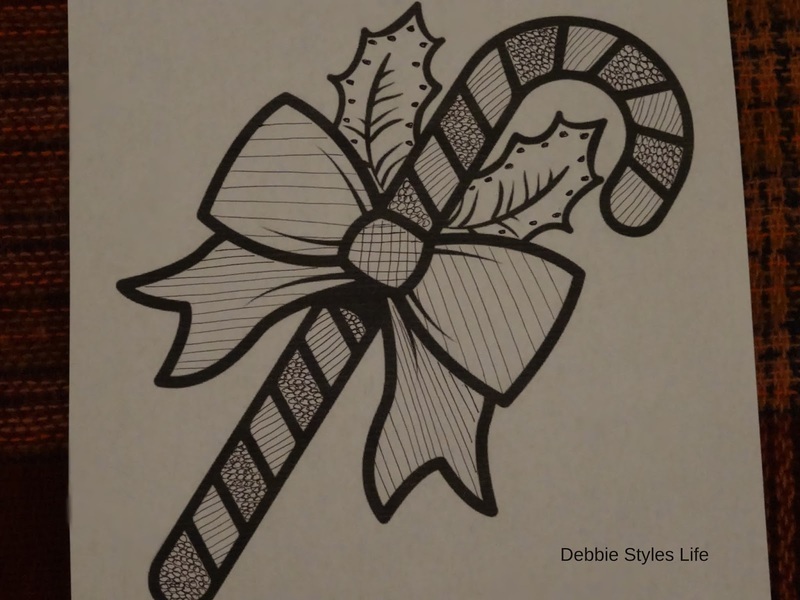 This is the year that I changed my blog name back to the original debbiethisandthat blogspot name and then to the new name of Debbie Styles Life. In retrospect, I realize that these changes came as a sort of "whiplash reaction" to fears over the new GDPR European Union rules that went into affect in May of 2018. I also now realize that I didn't need to be as worried about all of these changes as I was at the time. But, after reading blog after blog announcing these changes and asking "are you ready for the GDPR compliance?" I got a little nervous and felt like I had to make changes. So, that is when I went back to using my blogspot name so my blog could be completely under the Blogger platform. Then, about the time I was ready to go back to my original dot com domain with debbie this and that I found that someone else had bought the name! I realize that we're just talking about a blog name, but that was really a hard blow for me. 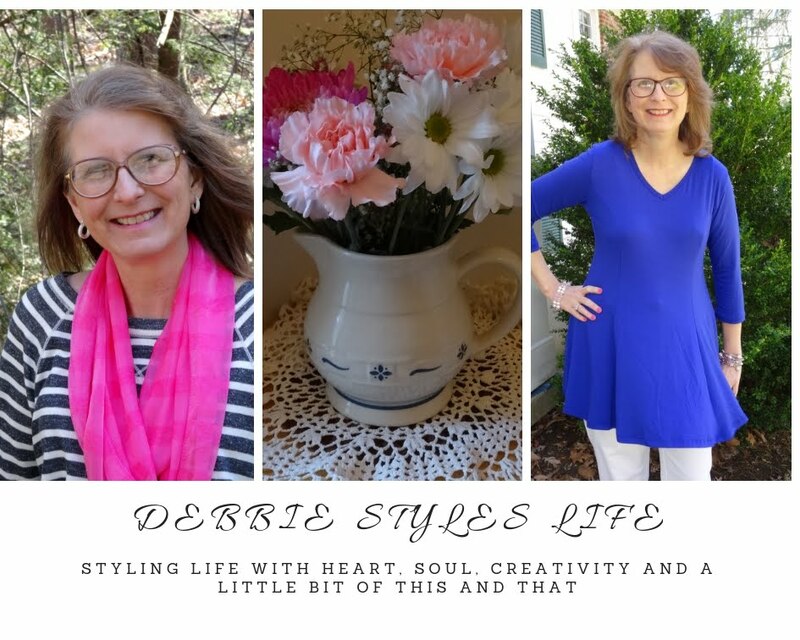 I had spent three years of my life working on my blog as debbie this and that and I just couldn't imagine identifying blog-wise with another name! You may recall that I chose four words as my perfect words for last year. One of those words was "chance." So, I decided to take a chance with a new blog name, thus debbiestyleslife.com was born! It's taken me awhile to adjust to this name, but I now realize that this name is the perfect blog name for me and my blog. 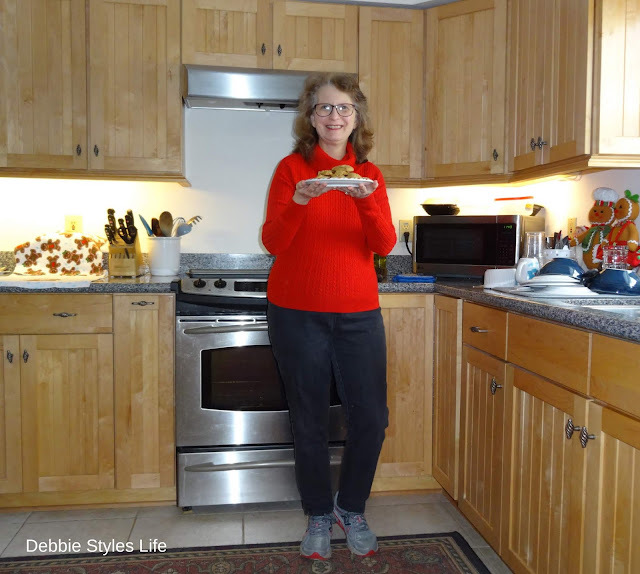 Styling life is exactly how I approach living whether I am decorating my home, cooking meals, choosing clothing, being a friend and family member or growing in my faith. We all have a "style" that we use to approach life. So, I now realize that my unfounded worries over GDPR compliance simply served as an impetus for timely change on my blog! And, I am thankful for these changes and so many other blessings in my life! Another of my four perfect words for 2018 was "thankful." I am so very thankful for healing of health issues within my family this year and on a personal level. I won't lie, folks, it's been a tough year for me and for my family health-wise. 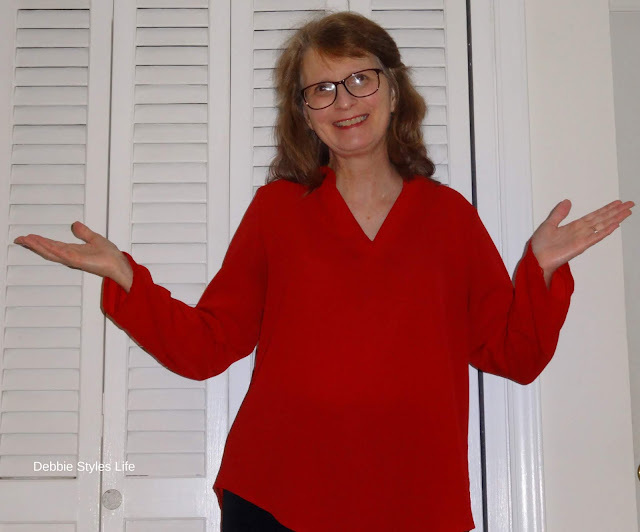 Between my husband's family and my family we have had all manner of surgeries for heart, kidneys, eyes and breast as well as illnesses related to heart, lungs, edema, sepsis, pneumonia and flu. On a personal level, I have struggled with shoulder pain issues related to frozen shoulder/impingement and experienced a broken rib which led to tests which uncovered other issues. Pain has been the name of the game for me this 2018 and I won't be sorry to see its backside! But, in all of this, my concerns and worries with family and my own health issues, God has been so faithful to comfort, heal and assure me, and others in my family, that we don't walk alone in this life. And for that, and many other blessings, I am so thankful! 2018 was the year when I turned 60 and this milestone for me has caused much introspection and joy! 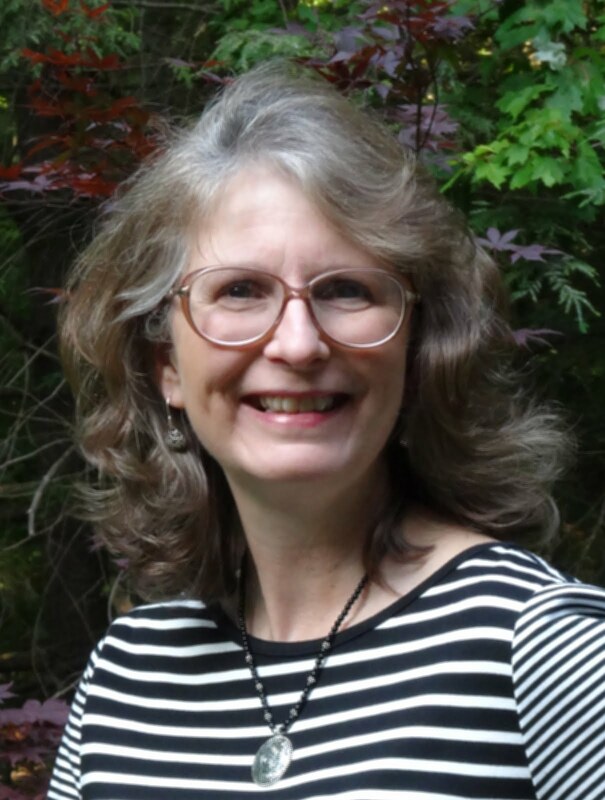 Yes, it's a wonderful thing to be 60 and to look back on 60 years of life and to experience gratitude for the many blessings that have come. Granted, not everything in those 60 years has been joyful, but, even in the tough times, there has been love and laughter and God's grace, yes even when tears were falling. I am thankful for 60 wonderful years and look forward to many new adventures in future years! My other two perfect words for 2018 were music and commitment. I found my pull to these words interesting and, when they came to me, I had no idea how they would play a part in my life. For a couple of years I had been helping out from time to time with the handbell choir at my church. Just ringing on an as-needed basis and doing some occasional directing of handbells and the chancel choir. I was even offered the job of directing handbells at the end of 2017 and ended up declining for several reasons. It just didn't feel right at the time. However, when our church music director resigned in October of this year to move North, I was again offered the position of handbell director and, this time, I felt it was the right time to make this commitment! Bell ringing and directing give me so much joy! And, this aspect of life was so very unexpected! Had you told me a few years ago that I would get such a kick out of ringing and directing the handbell choir I would not have believed you. But, God knew, and that is what makes ringing and directing so special to me. His plans are always so much better than our plans! Handbells suit me musically in so many ways that I won't bore you trying to describe. And, using my music and the knowledge gained from my music degree earned years ago is gratifying and satisfying to me, as well. But, going into this New Year of 2019, there is just one one perfect word. Simplicity. I like the sound of it. The way it rolls off the tongue. I'm eager to begin the adventure of simplicity. I wonder what I will be writing about this word next year at this time, God willing? So, that's my blog recap for 2018. I cannot leave the old year behind and welcome the new without sending heartfelt thanks to you, my dear readers. Without you, this blog would be quite lonely. I cherish each one of you and hope that 2019 brings only good things to each of you! I've come to accept that being a small-time blogger is where I'm meant to be at this time. I hope numbers continue to grow. As each new reader finds me and introduces themselves to me through comments I feel so happy. If you like what you read here, pass on my blog address to others. And, please let me know what you have enjoyed reading about on the blog in the past and what you would like to read about in the future. I love hearing from you! 1 Chronicles 16:11-12. Every good and perfect gift is from above, coming down from the Father of the heavenly lights, who does not change like shifting shadows. 1 Chronicles 16:8. A blessing for you, because the Lord your God loves you. Looking for a relaxing way to use your creativity and produce something pretty that is your own design? Zendoodling may be the answer! I was first introduced to Zendoodling a few months ago when a friend and I attended a class at our local library about Zendoodle. It is an art form that is distantly related to Zentangle and you can look online to find all sorts of info about each of these terms. In my own words, I would explain Zendoodling this way. You take a mostly empty shape or picture and embellish it with repeated doodle shapes. The doodling can be left black and white or you can add color if you wish. In the Zendoodle above, which I worked on at a Fall retreat, I added circles, hearts, music notes, dots and straight and squiggly lines and just added a bit of blue to the center. I decided to frame this particular piece, but you can just do it for fun and not worry about framing. Zendoodling is meant to be relaxing and fun, so worries about perfection in artistry are left at the door! This is another Zendoodle that I worked on recently. 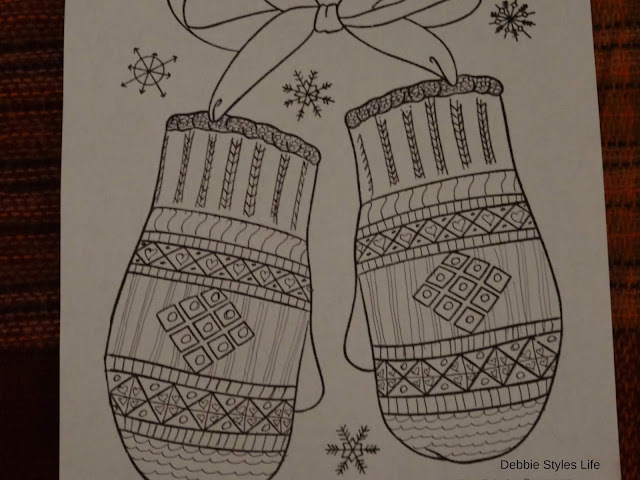 I looked online for free printable winter/holiday coloring pictures and printed the ones I thought were "empty" enough for my doodling. This is what the coloring sheet looked like before I added my doodling. 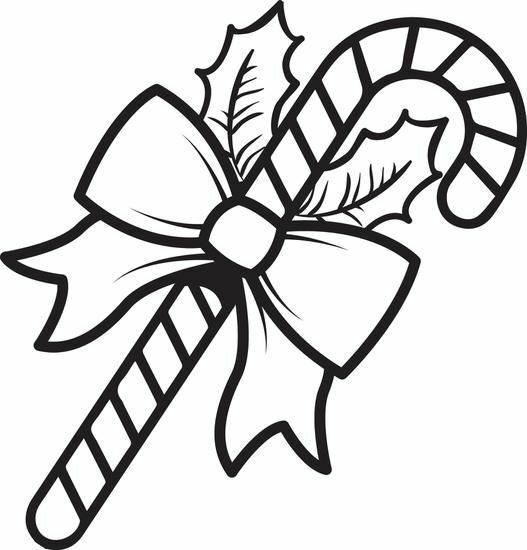 I also doodled this candy cane. And this is what it looked like before the doodling. Since I don't consider myself a good drawing artist, this is the perfect art form for me! I simply add my own doodles and create whatever shapes, squiggles, etc. I want to add to the picture! I find Zendoodle to be quite relaxing and easy to do. And, perhaps you would enjoy trying it too! As, I mentioned, there is lots of info online about Zendoodling and also Zentangle. I don't claim to be an expert, but I have taken what I learned at the library class and rolled with it! My understanding of Zentangle is that you start with a sort of square shape and add three points that you connect to create all sorts of interesting shapes. I haven't tried any Zentangle yet, but some of the online examples are beautiful and quite intricate! 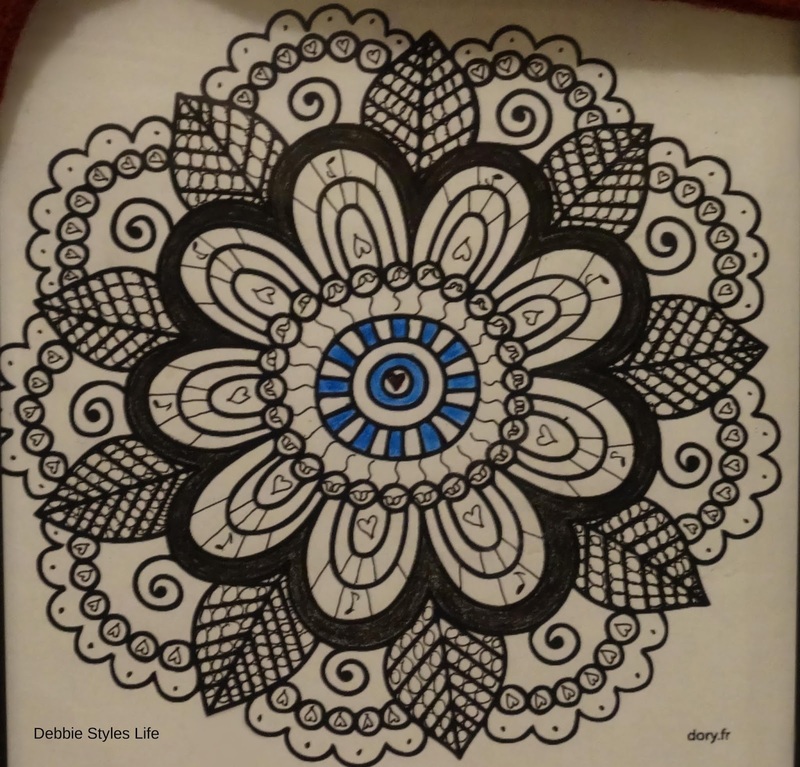 The important part of Zendoodle for me, however, is the relaxation part of the doodling. My mind relaxes while I doodle and time passes very quickly and calmly. A good thing! I sure hope you had a good Christmas day, dear reader! Ours was very low-key. I'll be transitioning to snowman/winter decor in the next week or so and will share that with you in a future post. I hope, though, that you will join me for this Sunday's post as I do a little reflection/blog recap of my thoughts about 2018 and will also reveal my "one perfect word" for 2019. Until then, have a great weekend and keep on doodling! Hey everyone! We're counting down to Christmas. Can you believe it is only 4 days away?! I did a little thrifting at Goodwill this past week and picked up a few things. 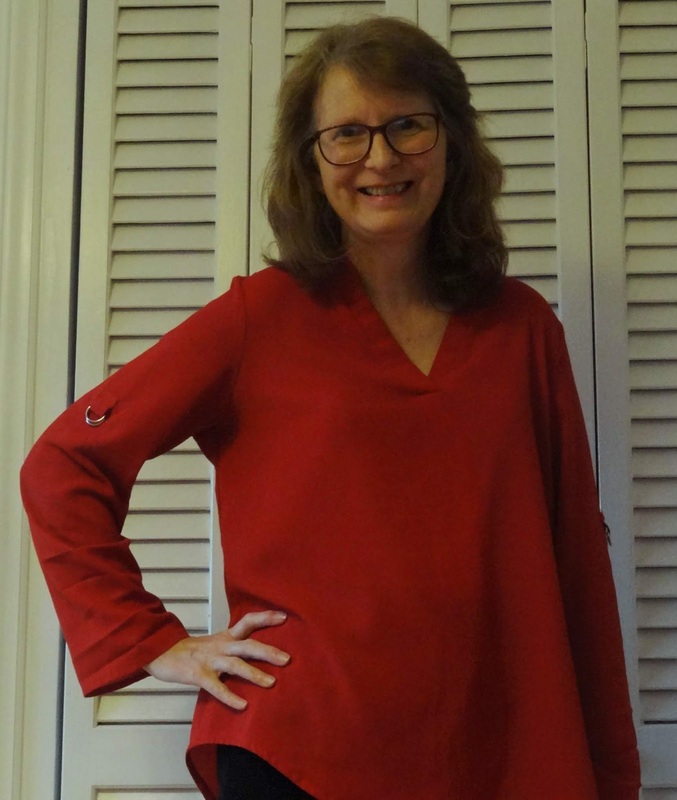 Today, I'm sharing this perfect red top. Couldn't believe I found such a perfect piece right here at holiday time. 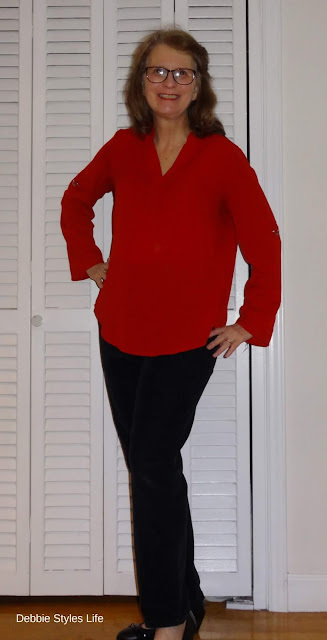 Besides being red and a perfect fit, there are a couple things that really sold me on this top. The cute silver loops on each sleeve add that "something extra" to the top. I also love the longer back which gives full coverage. This top is loose and flowy and I am thrilled to have found it! I will be wearing this top not just for the holidays but throughout the months ahead. The Mr. played for a Christmas concert tonight and I picked up an older friend and took her to the concert. She enjoyed it so much and so did I. Part of making Christmas wonderful is sharing good times with family and friends. I hope that each of you is experiencing warm moments of family and friendship during your holiday! And if you can spare a few extra moments go out and do a little thrifting. You never know what treasures you might find! Welcome to my Christmas kitchen! Around this time each year I do a few special things that are just for me. Things that give me pleasure and recall happy memories. I call these things,"Christmas gifts for myself." They cost next to nothing and yet are priceless! How about you? Do you "gift yourself" at Christmas time? One of the gifts I give myself is baking something yummy. I'm not a big baker, but it just doesn't feel like Christmas if I don't bake something. 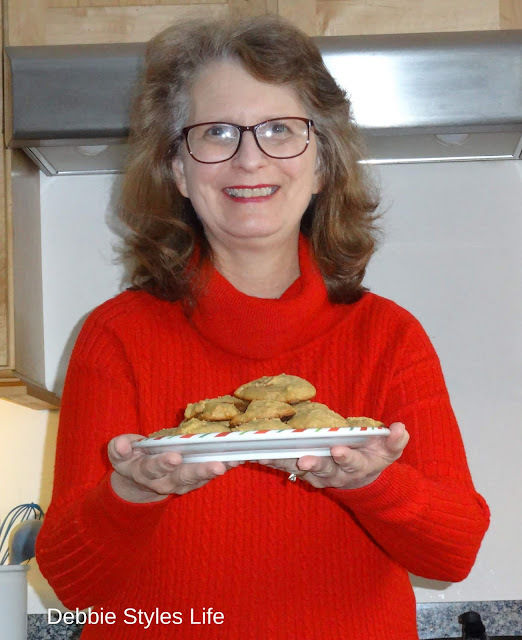 I tried a new really simple recipe for peanut butter cookies and the result was absolutely delicious! I can't take credit for the recipe. I got it from Julie Wunder's blog over at Running In A Skirt. 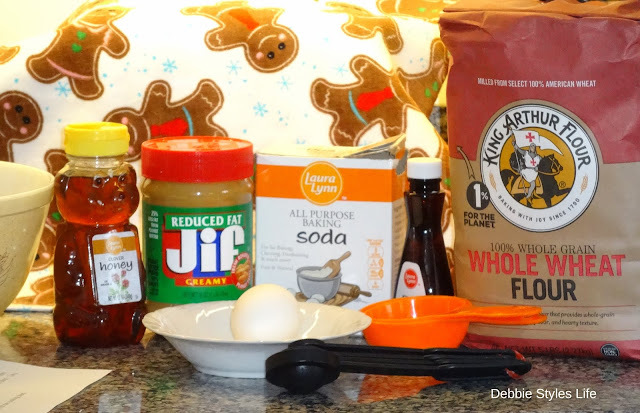 Check out her post here to get this simple six ingredient recipe! 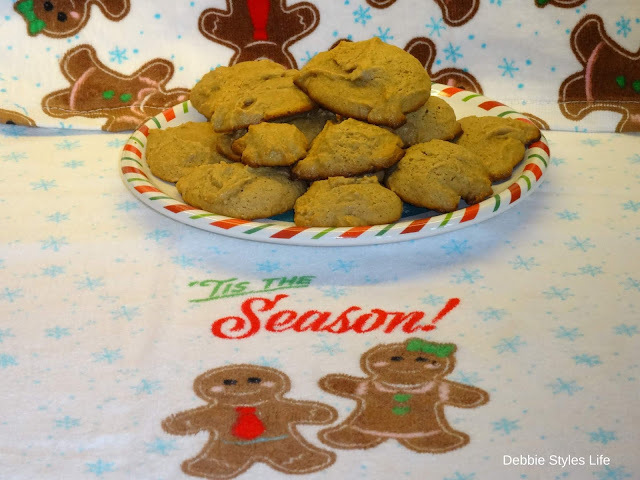 Not only are these cookies yummy but they are a bit healthier since the recipe calls for whole wheat flour and uses honey for sweetening instead of sugar. Yet another gift to myself, a healthier indulgence! And because I had all the ingredients on hand, they cost next to nothing! Another way I gift myself is with some wonderful Christmas reading. 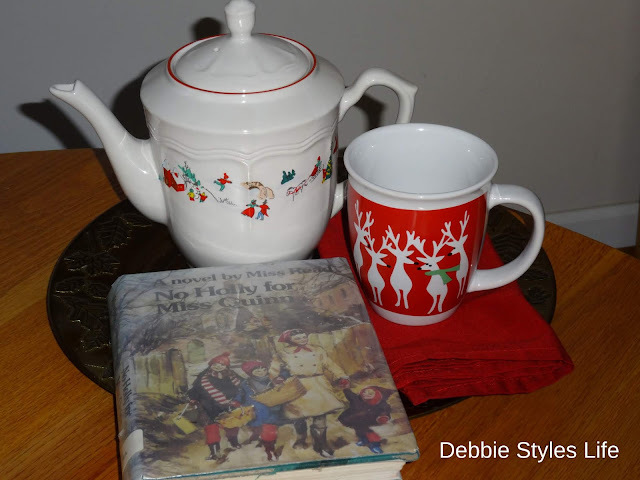 I always choose a book or two around this time of year that has a Christmas theme. This year I found, "No Holly for Miss Quinn," by Miss Read on the shelf at my local library. I thought I had read all of the Miss Read books the library had to offer but somehow I believe I missed this one. I loved it! Miriam Quinn is a thirty-something career woman who decides to have a quiet Christmas re-decorating her new home until a phone call from her brother changes all her well laid plans. I was hooked from start to finish in this book and think I'll ask "Santa" for my own copy as a Christmas present. So, this book cost me nothing since it came from the library, but I guess "Santa" might have to pay a few bucks to get it for me as a gift! And, as a final gift to myself, I created a fun "drink station" using all of my Christmas mugs. Since the mugs are displayed on a tray they can be easily moved if the counter space is needed. I've noticed on several blogs that Christmas displays on counters are on a tray. It suddenly dawned on me that this makes the display movable so the counter can be used. Makes so much sense! Anyway, being creative with Christmas decor is something I find satisfying and is definitely a gift to myself. Do you find ways to gift yourself at Christmas? If not, try to think of something special to do just for you. I hope you will take a moment and leave a comment letting me know what you think about gifting yourself and what you do for the very special person that is you! And, would you like to give me a gift? I would absolutely love it if you would follow my blog by email. Just type your email in the box on the right side of the blog and click submit. You'll never miss a post that way! And, before you go, have a cookie! Which Outfit Looks Best? Help Me Decide! I'm a firm believer that fashion should be fun for the person wearing it. It's easy to get bogged down with styles and trends and forget that you still have to enjoy what you are wearing. So, since today is still a "snow day" at my house and the Mr. is having a teacher workday at school I'm playing with fashion. Trying on different tops and different accessories to see which looks I like best. You can play along with me, if you like, and help me decide which look you like best. I'm keeping certain basics the same in each outfit. The pants, by Onque, the black long sleeved tee and the black Skecher booties are the same in each pic. The top and accessories are what is changing. Here, I'm adding just the grey sweater, a lovely patterned and warm two button sweater by Horny Toad with a unique Aztec patterned front. This sweater is 100% lambswool and is super warm and soft. 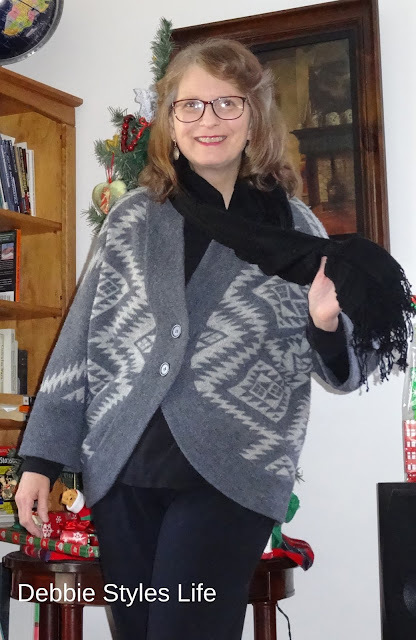 Here, I've kept the sweater but added a black fringe scarf as an accessory. I think the scarf adds a nice touch to the look. 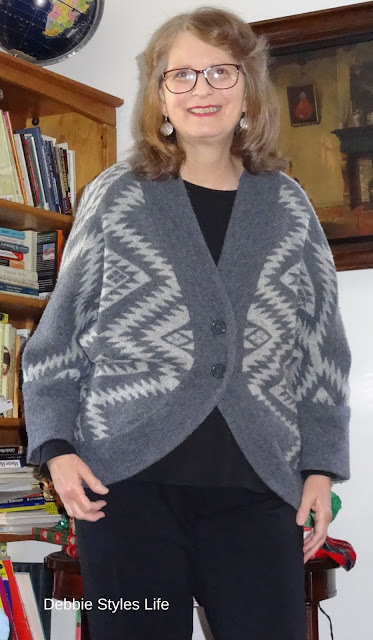 Now, I've changed sweaters to a solid black long cardigan which is Faded Glory brand. Wearing all black with no scarf or jewelry is a bit bland. Adding a long tiered pearl necklace makes a big difference! Here, I decided to belt the cardigan. I bought a new belt recently and it looks pretty and adds a different dimension to the look. And, finally, I'm still playing around with this red/black plaid number. I have styled it a couple times already here and here. I like how it looks with the pants and belted. So, this is the end of the fashion show! Now, it's your turn. Leave me a message and let me know which styling(s) you like best. I look forward to hearing your thoughts! For those who asked, here are a few pics of the "big snow" we are receiving as we speak. We are supposed to get another 3 inches. Time will tell! 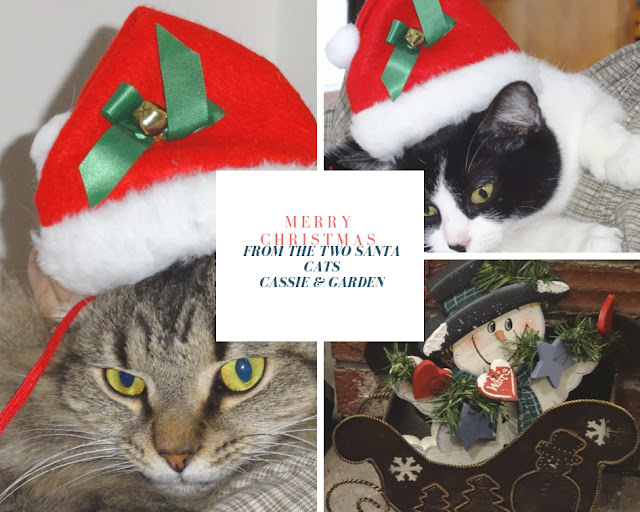 Don't forget to scroll all the way down and Cassie and Garden will give you a Christmas greeting! These pics are from our front and backyard this morning. These two cuties were not too happy with wearing the Santa hats! But, tradition calls!! Enjoy! Well, the great snow that was predicted has begun, so before the power goes off I thought I would share a little more Christmas fun with you. I continue to find cute gingerbread ornaments that I can't resist and am adding to the kitchen. These are my latest finds-a gingerbread family and a little gingerbread baby in a sleigh. They go well together, I think. And they match well with the gingerbread snowflake ornaments! 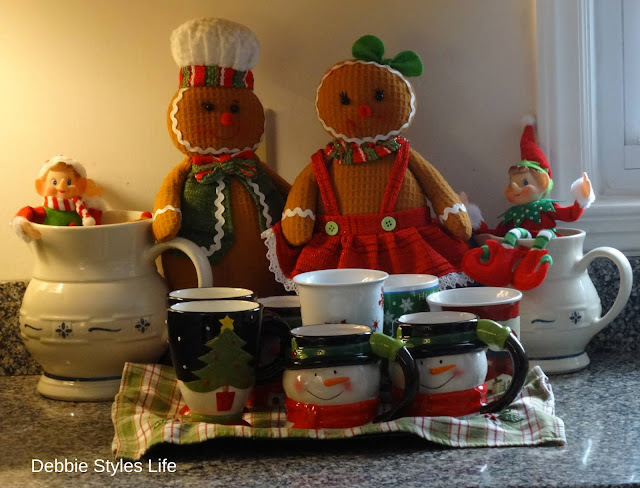 If you missed the other post about my gingerbread kitchen, you can catch up on the link. The lower foyer table holds several Santa's I have collected over the years. While the upper foyer table holds my ceramic Christmas tree. It's so pretty in the foyer which it is lighted. And, here is my pinterest-worthy front door wreath! I'm pretty proud of the bow I fashioned and the letter R in the center! I figured using this ribbon would extend the life of the wreath beyond Christmas and into winter. The pine cone ribbon is so pretty. A neighbor child sells green wreaths every Christmas season for a school fundraiser, so this is how I usually get my wreath. Then, I just embellish it! And, this is my latest Christmas craft. I fashioned this Christmas tree today using one of those foam tree forms and some Christmas fabric that I bought a couple years ago and never used. This was a very easy craft! I simply cut the fabric in a triangle shape and wrapped it around the tree securing it in place with straight pins. I folded the fabric under the tree, securing it with straight pins and folded it back on the top, securing it with straight pins. Then I threaded the white ribbon under the top fold and tied it in a knot, then threaded the white Christmas ball through the ribbon and tied a bow. I did have to use a straight pin to secure the the white ball and then, for good measure, I wrapped the two red balls around using the green pipe cleaner that was attached to them. I think it makes a really cute tree! The little mouse seems to like it! If you have small children in your home, you may not want to use straight pins. You could use a fabric glue or something else to secure the fabric and Christmas balls. I'm going to keep an eye on little Miss Garden to make sure she isn't messing with the tree, either! I hope you are having a wonderful weekend and are warm and safe if snowy weather is headed your way! Feel free to pin photos and hope you'll take a moment to leave a comment! I love hearing from my readers! *Not a gifted or sponsored post. All writing and opinions are my own. I love a top with fringe benefits and this one certainly has the fringe! I don't think I've shown this top on the blog before. I've had it a few years and always enjoy wearing it. 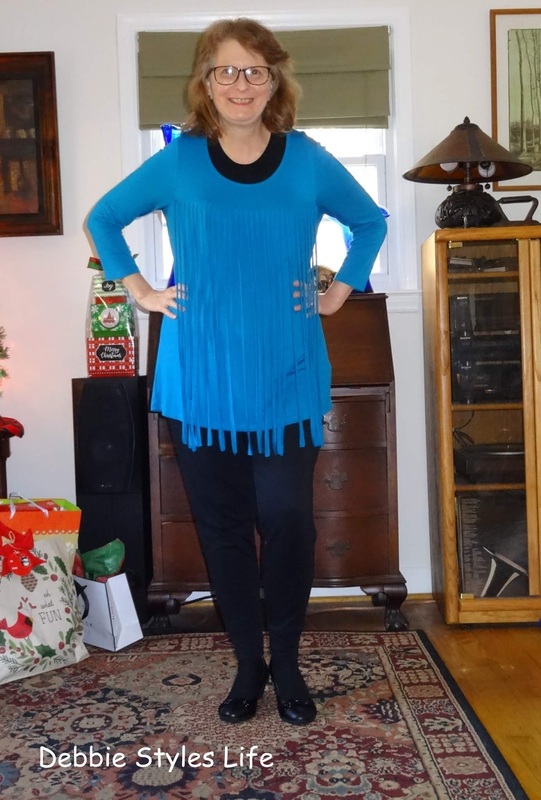 The blue color is one of my favorites and the fringe adds that "something extra" to the look. 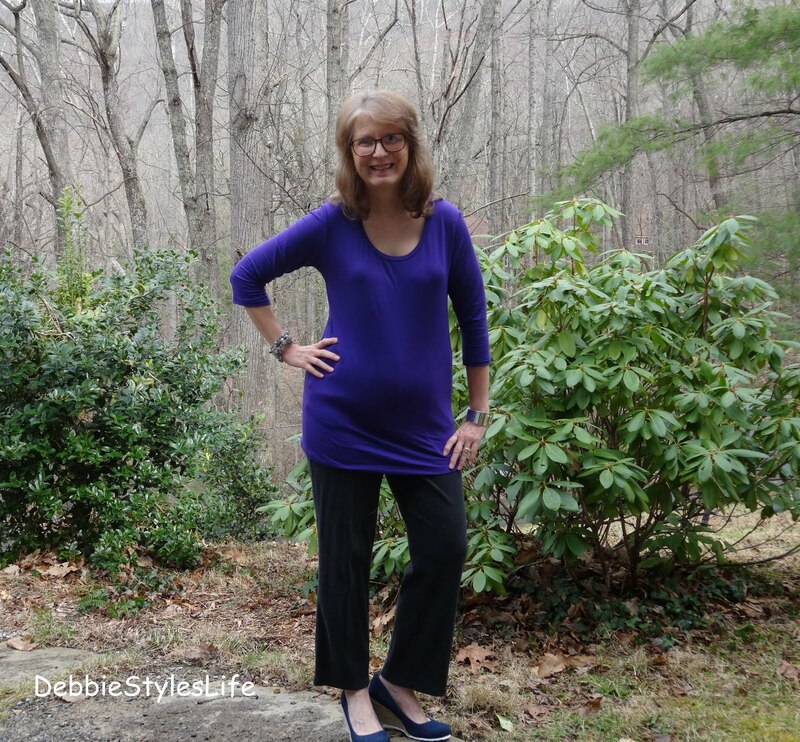 The material is soft and figure flattering and the fringe is great for hiding tummy problems. This top is by Melissa Paige and, like I said, I bought it a few years ago. But, I did find the exact top in an XL on Poshmark if you are interested. I have never purchased from Poshmark so cannot vouch for the experience of buying from there. The material is the soft viscose/spandex mix that so many tops are made from these days. It's machine wash and lay flat to dry which I love. I don't do dry cleaning! I like this dusty blue color! 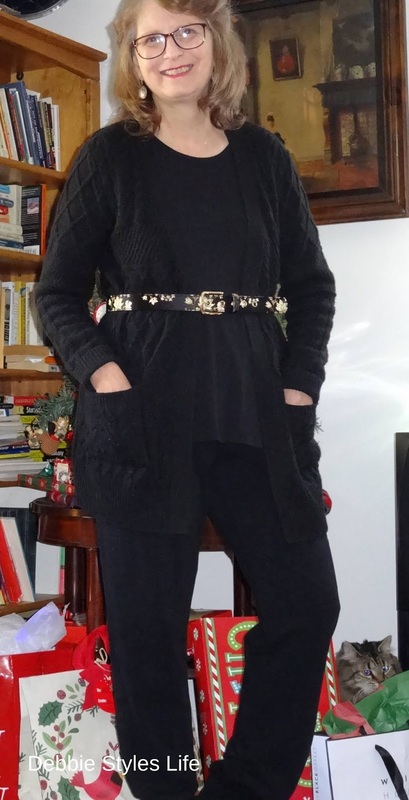 And this black is certainly figure flattering. Why not check out this link where I found these tops? I came across these shoes the other day and am very pleased with the comfort level. I haven't owned Thom McAn shoes (that I can remember) since I was a little girl. 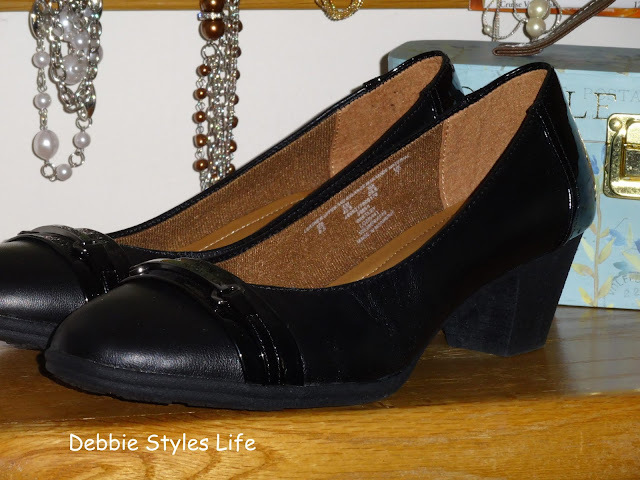 In fact, these shoes remind me of a pair I got when I was young and allowed to choose a shoe with a bit of a heel on it. Remember, ladies, hearing your heels click on the floor and how it made us feel all grown up?! These heels don't click, though, as they are made of rubber and have a really nice cushion effect. They are a block heel, also, which gives lots of support. The cushioned insole is quite comfortable, the round front gives my toes plenty of room and since the shoe is real leather they should last. I was able to buy this Thom McAn shoe on sale at $19.99. I see the price listed here is the higher price. We have some snow blowing today and I am staying in and planning on doing a little more decorating, a little cleaning, some laundry and, hopefully, a little sewing project. What's on your agenda for today? Hope you will leave a comment. I love hearing from you! There's nothing like a little gingerbread love to put you in the Christmas spirit and today I'm sharing my gingerbread inspired kitchen decor. I use the term "inspired" because not everything you'll see is gingerbread but most is. The decor that's not gingerbread is still colorful and fun. Some items you have seen before in other tablescape designs. I love mixing and matching to create a cheerful Christmas kitchen! The star of the show is this cute gingerbread table runner that I chose to place on the counter. Most of the time I show tablescapes at our round kitchen table. The truth is, however, that 99% of the time the Mr. and I eat our meals here at the counter. We love this space and our kitchen is the hub of our home. This counter is used not only for eating but for crafts, bill paying, lesson planning and is where the Mr. likes to sit and grade papers. So, it makes sense that I decided the runner would look great on the counter and serve as an anchor for the tablescape. My winter owl plates fit right in with the gingerbread ornament name tag and red napkins. The silverware is tucked inside the napkin so the name tag can show off on top. 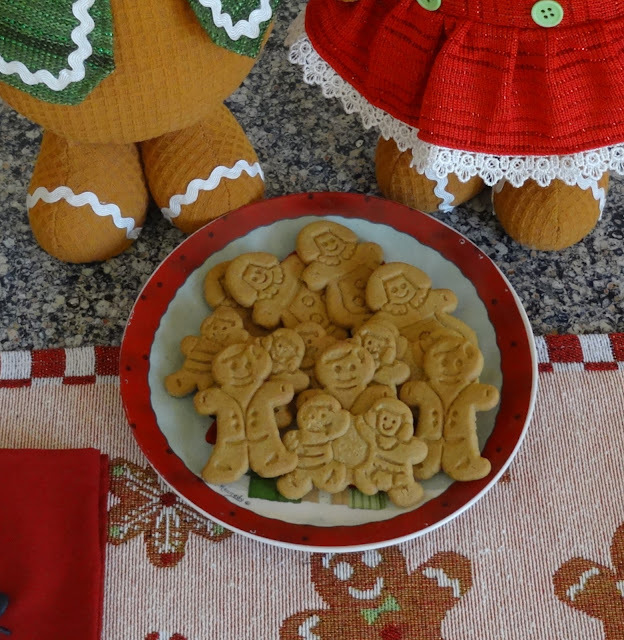 And how cute are these Pepperidge Farm gingerbread people? I found these on the cookie aisle at the grocery store. I decided to continue the gingerbread theme throughout the kitchen. So, I added these gingerbread snowflake ornaments to our brick wall. These are Jaclyn Smith ornaments from Kmart. I think these look great on the brick and I really like the black and white plaid hangers. It gives me an idea for creating a black and white plaid wreath for the kitchen! 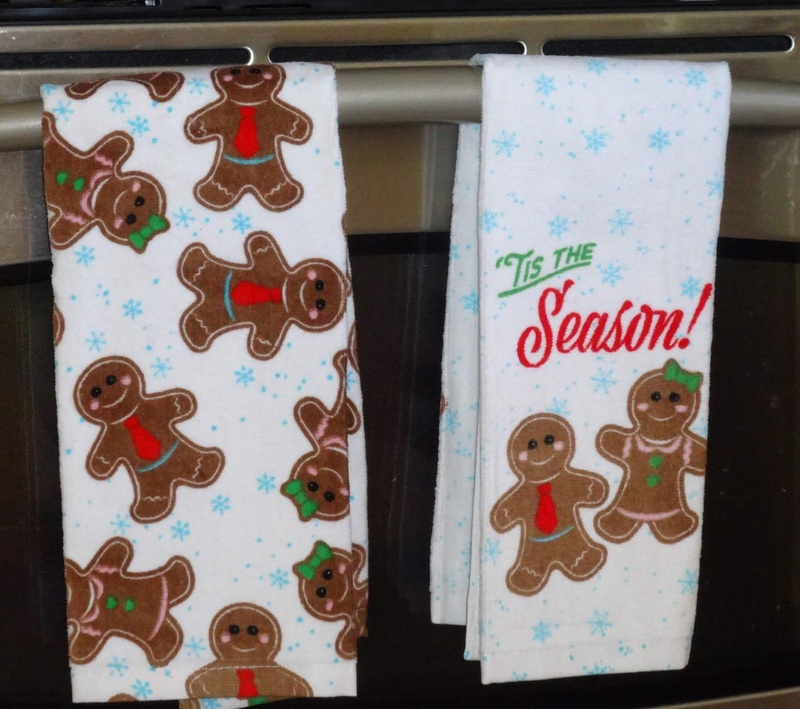 And, I also found these fun gingerbread kitchen towels at Kmart. They look great hanging on the oven door! 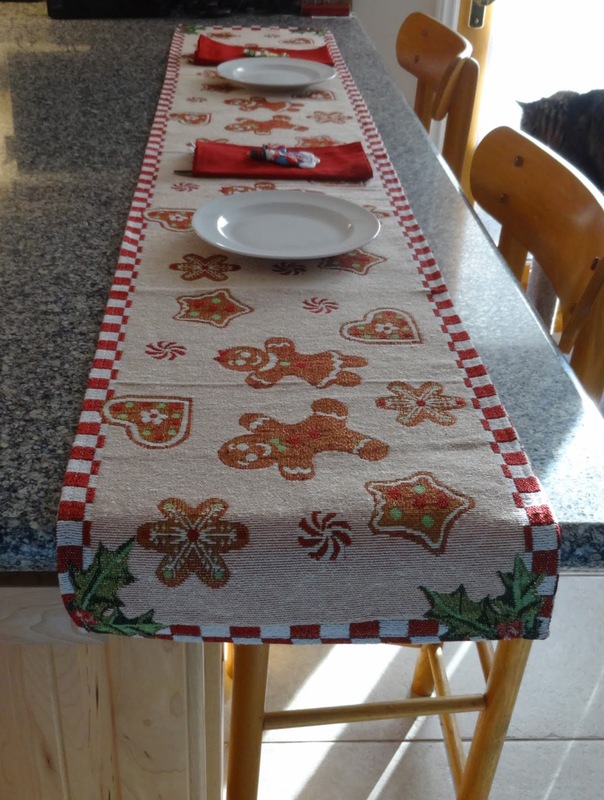 I can't be 100% sure, but I think I bought the gingerbread table runner at A.C.Moore. It was either there or Walmart. I had to use a snowman for the other name tag, but that works well with gingerbread. I decided to try my hand at crafting these two homemade gingerbread people, but I don't like the result at all and think I'll take them down. I think I need to use either smaller buttons or something else entirely for the eyes. Any suggestions from some of you crafty folks? I hope you are enjoying decorating and getting ready for Christmas. Let me know how your decor is coming along!